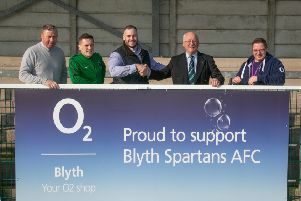 “A win’s a win,” was Blyth Spartans assistant manager Lee Picton’s succinct summary of his side’s 3-2 win at Grantham on Saturday. Goals from Alex Nicholson, Robbie Dale and Sean Reid earned the Green and Whites the three points. Picton said: “It was a hard earned win. It was a game where we had to play a bit ugly to get the result. Having said that, we started where we left off playing like we did last Saturday and Tuesday. “To be fair to Grantham they worked really hard, although we maybe gifted them their first goal, which let them back in to the game and after that we had to really dig in to come away with the three points. “It showed we have got that blend of being able to play attractive football as well as being able to grind out results as well.